Experience the highest possible quality class with a natural character in an environmentally friendly and sustainable printing process. High quality control, accuracy of fit and the latest technology paired with experienced craftsmanship make our premium textile prints the perfect surface for your motifs. This printing process is a special case among other printing processes. It is the most durable of all and there is no direct inking. The special feature: The ink changes its physical state, becomes gaseous and sublimes directly info the polyester fibre and colours it. The motif emerges from the tissue itself so to say. This results in brilliant, lightfast colours with pin-sharp images. This means that the print is absolutely odourless and not tangible, making it perfect for indoor use. You get premium textile and printing quality, oil and water-based without chemical additives. Our fabrics are storage-friendly, due to their wrinkle-free feature and washable in every standard washing machine. Furthermore, our materials are lightfast, water-resistant and also suitable for outdoor use. This guarantees long durability and a long service life with top quality. Of course, we also meet different requirements, if in individual cases, solvent or latex prints are supposed to be used. n addition to gentle textile printing for our own Luminatore® Lightmaster Professional systems, we can also offer chemical digital printing on tarpaulin, mesh, photo wallpaper and panels. Because the textile is handmade, we can of course implement special requests. 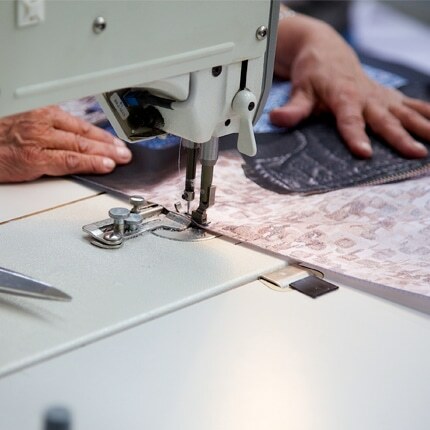 The most common processings such as cut to size, loosened, hemstitched and finished with Keder and Velcro tape is a standard step for us which we will gladly carry out on request for your individual case. 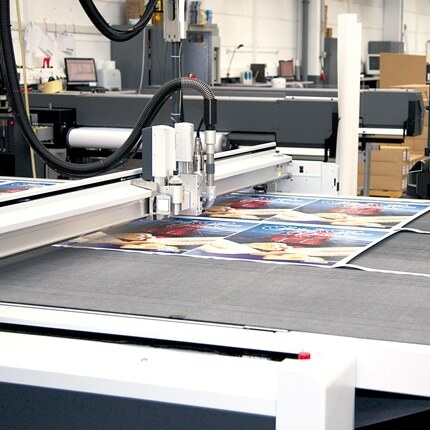 For us, printing is another word for service: From careful data preparation in pre-press - whether you have a finished PDF or a layout request - from clean digital printing on textiles to packaging, we will guide you on your way to the optimal printed product. Your project needs ad print with special further processing in the form? You need a custom cut, e.g., a diagonal or rounded? That too, is no problem, we are happy to advise you regarding your requirements. The material processing with a sewn-on Keder that disappears into the prefabricated groove of our frame system creates the impression of a frameless image. With the help of the attached flap, motif changes can be carried out easily and without tools. WANT TO LEARN MORE... about the innovative thermal sublimation process? Then contact us, we are happy to answer your questions.